Volume 14 of the Gabriel Wells Definitive Edition is A Connecticut Yankee in King Arthur's Court. The Appreciation was written by Stephen Butler Leacock (b. 1869 - d. 1944). Leacock was born in Swanmore, England but immigrated to Canada with his family when he was six years old. Leacock attended the University of Toronto and obtained a degree in 1891. In 1899 he went to graduate school at the University of Chicago obtaining his doctorate in political science and political economy. Leacock returned to Canada and joined the faculty of McGill University. To supplement his teaching income, Leacock turned to humorous writing. Between 1915 and 1925, Leacock was one of the most popular humorists in the country. Sunshine Sketches of a Little Town in 1912 is considered his breakout success and it was widely compared to the work of Mark Twain. THE story entitled A Connecticut Yankee in King Arthur's Court is something other and greater than a funny book. It is work written with a high purpose, to convey what seemed to its author the most profound and elemental truths about human society. It is a book that is inspired by a passion for righteousness and justice, which blazes out at times in a flame of indignation. The fundamental idea of the book was one that had long lain dormant in Mark Twain's mind. It had at intervals been taken up and laid aside. But the principal part of the writing was done at Quarry Farm, Elmira, in 1888, where Mark Twain worked at it with a frenzy of interest. The book was completed at Hartford and published in the United States and England in 1889. It has been variously judged. In England it let loose at once a torrent of indignation. It was interpreted as a direct attack on the hereditary and aristocratic institutions of Great Britain. It was declared by the reviewers to be an "audacious sacrilege" and, what is worse, "a lamentable failure." In various quarters the discovery was made that Mark Twain, until then the delight of the English reading public, was not funny at all. In the author's own country, the political teaching of the Yankee made a strong appeal and there were many to agree with W. D. Howells, who called it "a mighty great book-glorious, simple, noble." But the work, none the less, even in the United States, has not escaped severe treatment at the hands of the critics. There are those who say that the noble purpose of the book is sacrificed again and again for the sake of mere burlesque buffoonery. There are others who complain that the fun of the book is spoiled by the intrusion of too much serious purpose. In other words some of the critics would like to cut out the fun and leave the political thought, and others to cut out the political thought and leave only the fun. Between them there would be little left. But the truth is that on both sides of the Atlantic the Connecticut Yankee has been read by countless thousands of persons who are not literary critics, with unalloyed delight. Such persons, -- and I am glad to number myself among them, -- would not willingly alter a single word of the story. For the Connecticut Yankee, whether the book is good or bad, is, to my thinking, the most typical product of Mark Twain's genius. He wrote it for its own sake. The question of money did not enter into it. There was no thought in his mind of pleasing the public with it. He knew well that in England at any rate it might easily give offence. But he ascribed this to the fault of the English. "You (Englishmen)," he wrote to his English publisher, "are thin-skinned. An Englishman may write with the most brutal frankness about any man or institution among us and we republish without dreaming of altering a line or a word. But English cannot stand that kind of book written about herself." He told his London publishers to print the bunk without altering a single word: failing which, he proposed to print it at his own expense. In other words the book was written because Mark Twain had something to say which he felt had got to be said, and to be said in his own way. Those who object either to the matter or the manner of the Connecticut Yankee are really objecting to Mark Twain. You cannot alter the one without altering the other. The groundwork of the book is simple enough, -- as simple as great ideas usually are. A Connecticut Yankee, a man "without the refinement of the weakness of a college education" but with a perfect knowledge of machinery, is transported backwards in time, by an easy literary device, to the England of the Court of King Arthur. Forthwith the ground is prepared for the most glorious contrast,-a basis both for pure fun and for deep reflection. There is the contrast between dress and the speech of the Yankee, and the coats of armor and the quaint English of King Arthur's Knights. There is contrast between the childish "magic" of Merlin and the practical knowledge of the Yankee, who can make telephones and telegraphs and introduce in the place of Merlin's spells the "magic" of electricity. And there is, principally and as the central idea of the book, the contrast between the life and thought of the half-mythical days of King Arthur and those of the age of machinery in which we live. To Mark Twain's thought the comparison is all in favor of our age: he sees in the earlier century little but dirt, squalor, ignorance, and superstition around which legend and fable had thrown a veil of cobwebs glittering in the mists of time, and he proposed to tear away the veil and show the thing as it was. His own age he idealizes as the age of light and freedom. In other words he shared in that easy confidence in the age of machinery that was typical of the later nineteenth century. He could not foresee that the time was to come when the Great War would leave our age of machinery a mere litter of debris on the ground. He thought he saw finality in our civilization where as yet there was nothing but a beginning. The same point of view, uncorrected by the world disasters of our own day, appears in the political thought that underlies the book. It represents at once the strength and the limitations of Mark Twain's mind. Its strength lies in its nobility of purpose. Mark Twain had grasped, or thought he had, certain great elemental truths which alone can be laid down as the foundations of organized society,-such as that all men are equal, that no man can have a hereditary right to lord it over others, and that the only just rule is the rule of the majority. In the days in which we live these "elemental truths" must receive a sorrowful reconsideration. The eclipse of civilization that darkens eastern Europe cannot readily be illuminated with a ballot box; and a "majority" made up of crooks or bolsheviks may burn, torture, and destroy a minority with as great a rapacity as even that of kings and knights. A court of heads is not the final word in human government, and our conception of freedom is being redefined. A new appreciation is being placed upon the cohesion of society, a thing which Mark Twain, like all his generation, easily took for granted. A new value has got to be set upon order and continuity, and even such a dreadful thing as a king, in his historic place and sphere, may be pardoned nowadays by the rest of free Americans. To the scholar, therefore, the political thought of Mark Twain as shown in the Connecticut Yankee might seem crude and elementary. There is no doubt that, as a treatise on political science, the book will not pass muster. But it can still stand, with whatever limitations it may have, as a noble and passionate expression of an ideal of freedom. IT was one afternoon of the winter of 1884-85, in Rochester, New York, that Mark Twain and George W. Cable, then making their famous reading tour together, wandered into a book-shop to find something to read on their railway journeyings. Pulling over the volumes on one of the tables, Clemens happened to pick up a little green cloth-bound book, and began turning the pages with increasing interest. "Cable," he said, "do you know anything about this book -- the Arthurian legends of Sir Thomas Malory?" Cable answered, "Mark, that is one of the most beautiful books in the world. Let me buy it for you. You will love it more than any book you ever read." Dream of being a knight-errant in armor of the middle ages. Have the notions and habits, though, of the present day mixed with the necessities of that. "As I read those quaint, curious old legends I suppose I naturally contrasted those days with ours, and it made me curious to fancy what might be the result if we could dump the nineteenth century down into the sixth century and observe the consequences." I have begun a book whose scene is laid far back in the twilight of tradition; I have saturated myself with the atmosphere of the day and the subject, and got myself into the swing of the work. If I peg away for some weeks without a break I am safe. But he had too many irons in the fire for that. He put the story aside presently, and seems to have forgotten it altogether for nearly two years. Then in the summer of '88, in his Elmira summer home, Quarry Farm, the fever of it came upon him. Certain prominent Englishmen, Matthew Arnold among them, had been criticizing American institutions; and, while Mark Twain himself was willing to criticize his native land on occasion, he did not welcome strictures from across the Atlantic. He covered a good many quires of paper with caustic replies, bitterly denouncing every shaky British institution, touching every weak spot in hereditary rule. He did not offer this matter for publication, but, being well warmed up by this time, he was in proper condition to take up the tale of the Yankee in King Arthur's Court, and make that astonishing hero the mouthpiece of his doctrines. He expected now to complete the book before the end of the summer. He worked at a great rate, but the manuscript went with him back to Hartford still unfinished, and it was not until the spring of '89 that he added the final chapters. Mark Twain himself had a good deal of faith in his new book as a plea for humanity, and he wished it illustrated in a way that would not only follow, but forward his purpose. He had admired some pictures made by Daniel Carter ("Dan") Beard, for a Chinese story in the Cosmopolitan, and he made up his mind that Beard was the man for the Yankee. A meeting was arranged, and in a characteristic interview the contract was made. Clemens gave instructions that the artist should obey his own inspirations, and put on paper any picture that he saw in his mind, whether humorous or serious. "I want his genius to be wholly unhampered," he said; "I shan't have any fear as to results." My pleasure in them is as strong and fresh as ever; I do not know of any quality they lack. [And when the drawings were completed:] Hold me under permanent obligations. What luck it was to find you! There are hundreds of artists who could illustrate any other book of mine, but there was only one who could illustrate this one. Yes, it was a fortunate hour that I went netting for lightning-bugs, and caught a meteor. Live forever! It was not too much praise. Beard realized the last shade of the author's allegorical intent, and portrayed it with a hundred accents of his own. "It is a mighty book, and it makes my heart burn with wrath." And a few days later, "The book is glorious; simply noble." And when he had finished it: "Last night I read your last chapter. As Stedman says of the whole book, 'It is titanic.'" I'm not writing for those parties who miscall themselves critics, and I don't care to have them paw the book at all. It is my swan song, my retirement from literature permanently, and I wish to pass to the cemetery unclodded. Mark Twain's desire to "pass to the cemetery unclodded" was not observed. A book so fiercely radical as A Yankee at King Arthur's Court would not be likely to get by the critics without pretty vigorous attention, favorable or otherwise, according to the reader's convictions. There is not room in a brief chapter like this to discuss the story at length, and there is no need. A Connecticut Yankee at King Arthur's Court is nothing less than a brief for human rights and human privileges, and each reader will constitute a jury unto himself. It was widely denounced in England as sacrilegious; and to some extent this opinion was echoed in America. Howells ranks it as Mark Twain's highest achievement in the way of a "greatly imagined, symmetrically developed tale." In another place he wrote, "Of all the fanciful schemes in fiction, it pleases me most." This is high praise, to be sure, and perhaps warranted. Colossal it certainly is, as Howells and Stedman agreed -- colossal in its extravagance as in its sublimity. Intended as a fierce heart-cry against human injustice -- "man's inhumanity to man" -- it seems a pity that it should have been more than that -- that so much of it should have been mere grotesqueness and burlesque; but that is only an opinion, and very many readers, no doubt, would miss their greatest delight if those paragraphs were pruned away. * The full text of this original introduction is given in Mark Twain: A Biography, Appendix S.
The Gabriel Wells Definitive Edition of A Connecticut Yankee in King Arthur's Court features the same frontispiece and four of the six illustrations by Daniel Carter Beard that had appeared in the 1899 uniform editions of A Connecticut Yankee published by American Publishing Company. 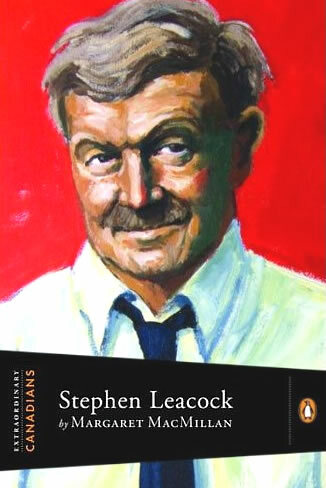 "Stephen Leacock." Online at wikipedia, accessed 11 June 2010. "Stephen Leacock, Humorist, Is Dead," The New York Times, 29 March 1944, p. 21.